A page in an eighteen-century book of an engraving of the Mona Lisa. History lessons then and now. I never noticed that the Mona Lisa had a cleavage as I do in this engraving. It strikes me funny that two people can look at the same thing and have two completely different impressions of it. The engraver back then seem to notice her cleavage more than her smile. "Louvre Museum and draws thousands of jostling spectators each day. It is the most famous painting in the world, and yet, when viewers manage to see the artwork up close, they are likely to be baffled by the small subdued portrait of an ordinary woman. She’s dressed modestly in a translucent veil, dark robes, and no jewelry. Much has been said about her smile and gaze, but viewers still might wonder what all the fuss is about. Along with the mysteries of the sitter’s identity and her enigmatic look, the reason for the work’s popularity is one of its many conundrums. Although many theories have attempted to pinpoint one reason for the art piece’s celebrity, the most compelling arguments insist that there is no one explanation. The Mona Lisa’s fame is the result of many chance circumstances combined with the painting’s inherent appeal. There is no doubt that the Mona Lisa is a very good painting. It was highly regarded even as Leonardo worked on it, and his contemporaries copied the then-novel three-quarter pose. The writer Giorgio Vasari later extolled Leonardo’s ability to closely imitate nature. Indeed, the Mona Lisa is a very realistic portrait. The subject’s softly sculptural face shows Leonardo’s skillful handling of sfumato, an artistic technique that uses subtle gradations of light and shadow to model form, and shows his understanding of the skull beneath the skin. The delicately painted veil, the finely wrought tresses, and the careful rendering of folded fabric reveal Leonardo’s studied observations and inexhaustible patience. And, although the sitter’s steady gaze and restrained smile were not regarded as mysterious until the 19th century, viewers today can appreciate her equivocal expression. Leonardo painted a complex figure that is very much like a complicated human. The Mona Lisa was certainly more famous after the heist, but World War I soon consumed much of the world's attention. Some scholars argue that Marcel Duchamp’s playful defacement of a postcard reproduction in 1919 brought attention back to the Mona Lisa and started a trend that would make the painting one of the most recognized in the world. He played against the worship of art when he drew a beard and mustache on the lady’s face and added the acronym L.H.O.O.Q. (meant to evoke a vulgar phrase in French) at the bottom. That act of irreverence caused a small scandal, and other cunning artists recognized that such a gag would bring them attention. For decades after, other artists, notably Andy Warhol, followed suit. As artists distorted, disfigured, and played with reproductions of the Mona Lisa, cartoonists and admen exaggerated her further still. Over the decades, as technology improved, the painting was endlessly reproduced, sometimes manipulated and sometimes not, so that the sitter’s face became one of the most well known in the world, even to those who had little interest in art. After antiquing the entire morning at the brocante we went for lunch, we celebrated with our friend Joanne who had just received a copy of her new book (more about that tomorrow) plus we talked about what each of us had found during our morning hunt. Later with renewed energy, we went back to take a second look, I enjoy going back and walking the opposite way around at the brocante, taking it slow, looking under tables, in the back of the vans, looking at things I normally don't look at the first several times around, and then just like that this thick vélin / parchment roll stared at me. I couldn't believe that I had not seen it and that it was still there late in the afternoon. Somethings are just meant to be yours. Somethings take a long time to come into your hands, but when they do it has an amazing effect like the stars are lining up, that flowers are blooming a crown on your head and or that you feel like shouting, "Amazing Grace!" I gave a squeal. A thirteen panel, hand-sewn into a seven meters long marriage contract between two Nobel families sat on a table as if it were something as common as a baguette and cheese sandwich. At the brocante I never know what I am going to find but one thing is certain it never fails my imagination. I bought it, and hope to sell it one day but would be hard to accept if someone was going to cut it up, so maybe I will donate it to a museum, or maybe open my own museum. If you are in Provence come on over and see it. "According to the Roman Varro and Pliny's Natural History, vellum and parchment were invented under the patronage of Eumenes of Pergamum, as a substitute for papyrus, which was temporarily not being exported from Alexandria, its only source. Herodotus mentions writing on skins as common in his time, the 5th century BC; and in his Histories (v.58) he states that the Ionians of Asia Minor had been accustomed to give the name of skins (diphtherai) to books; this word was adapted by Hellenized Jews to describe scrolls. Parchment (pergamenum in Latin), however, derives its name from Pergamon, the city where it was perfected (via the French parchemin). In the 2nd century B.C. a great library was set up in Pergamon that rivaled the famous Library of Alexandria. As prices rose for papyrus and the reed used for making it was over-harvested towards local extinction in the two nomes of the Nile delta that produced it, Pergamon adapted by the increasing use of vellum and parchment. Writing on prepared animal skins had a long history, however. Some Egyptian Fourth Dynasty texts were written on vellum and parchment. Though the Assyrians and the Babylonians impressed their cuneiform on clay tablets, they also wrote on parchment and vellum from the 6th century BC onward. Rabbinic culture equated the idea of a book with a parchment scroll. Early Islamic texts are also found on parchment. One sort of parchment is vellum, a word that is used loosely to mean parchment, and especially to mean a fine skin, but more strictly refers to skins made from calfskin (although goatskin can be as fine in quality). The words vellum and veal come from Latin vitulus, meaning calf, or its diminutive vitellus. In the Middle Ages, calfskin and split sheepskin were the most common materials for making parchment in England and France, while goatskin was more common in Italy. Other skins such as those from large animals such as horse and smaller animals such as squirrel and rabbit were also used. Whether uterine vellum (vellum made from aborted calf fetuses) was ever really used during the medieval period is still a matter of great controversy. There was a short period during the introduction of printing where parchment and paper were used interchangeably: although most copies of the Gutenberg Bible are on paper, some were printed on animal skins. In 1490, Johannes Trithemius preferred the older methods, because "handwriting placed on the skin will be able to endure a thousand years. But how long will printing last, which is dependent on paper? For if ...it lasts for two hundred years that is a long time." In the later Middle Ages, the use of animal skins was largely replaced by paper. New techniques in paper milling allowed it to be much cheaper and more abundant than parchment. With the advent of printing in the later fifteenth century, the demands of printers far exceeded the supply of vellum and parchment. To continue reading please follow the links above. Have you checked out the Eiffel Tower on Google Earth? Louis Rossignol (1694) was a master calligraphist. "Not all calligraphy is the same. In fact, this form of artistic handwriting can actually fall into a number of different styles. Essentially, there are three main of calligraphy: Western, Arabic, and Oriental. Within each style there, maybe several lettering sub-styles or hands. Louis Rossignol was instructed in the art of writing by Olivier-François Sauvage, the most reputable teacher of the time (who didn’t publish any copybook), but was prematurely expelled from his school for having copied his master’s works so successfully that Sauvage didn’t even see the difference… Rossignol is one of the masters who invented and perfected the “Coulée” script (a cursive hybrid of the Ronde and Batarde). He didn’t publish any copybook while he was alive, this book was composed using Rossignol’s works, unfortunately, the engraver was not as subtle with his tool as Rossignol was with his pen." "The casting is a type of French handwriting, appeared in the seventeenth century. which satisfied the secretaries at the time of Colbert. The casting is traced with a feathered beaked feather, which is held "longer between the fingers" in comparison with other writings. or more if it is possible. The writing angle is 20 degrees, and the inclination of the letter is 25 degrees to the vertical. and the words remain interrelated. Interlining remains four bodies. Little casting. More difficult to master, it requires attention and sobriety. although all are quick writings. The six-line leading makes it possible to lengthen the heads and tails." Finding this large cotton wad booklet after years of collecting antique letters/paper, documents, and writings felt like I found a diamond in a haystack. Not much is written about Louis Rossignol that I could find on the internet about his life. So instead I will show some of the examples from the booklet that I found. I found this with many other pages, in fact, it was a chapter of sorts describing different types of work in the 1700s. The booklet as it wasn't bound was not complete. The pages measured 50 cm approximately. (A sander, or Pounce Pot Sprinkler, an implement used to hold a fine powder, most often made from cuttlefish bone, to sprinkle on wet ink or rough paper to make it smooth for writing. Used before blotting paper) As Kim was a calligraphist it was a delightful find. Unfortunately, it was dearly expensive and as I had never seen one before I was unsure of its value. Needless to say, we both dearly regret not buying it. "Pounce is a fine powder, most often made from powdered cuttlefish bone, that was used both to dry ink and to sprinkle on a rough writing surface to make it smooth enough for writing. The pounce or sand is gently sprinkled all over the writing on the paper." Also, "Gum Arabic was used in printing, As calligraphers, used as a binder, to control viscosity, to add a bit of luminosity, reduce feathering and bleeding, and to prevent cracking of ink." Kim is coming back for another adventure this May. I think a Sander is on top of her list. How was ink made back then? "Iron gall ink was made up from galls (usually oak-galls), copperas [copper sulfate] or green vitriol [ferrous sulfate], and gum arabic, in varying proportions; carbon inks were developed using soot." Take the tweezers and clean out any materials left in the cut shaft. Dip your new quill pen into some non-permanent ink. A writing desk why not. When my father passed away Anna a blog reader/friend of mine made me a beautifully scripted booklet from her own pen. Handwriting is such beautiful art, especially now as it seems to be slipping away. Anna and Kim are both master calligraphists. What a sight to make one oh and ah. And every time I see Cassis I sigh, "Beautiful!" Cassis anytime never disappoints, especially at twilight. What place do you never tire of seeing? If you come to Provence take time to be, time to let Provence get under your skin and into your heart. Provence is a place to wander aimlessly, to taste the countryside, to soak in the sounds and to follow your thoughts until they are just a mountain of softness and valleys of delight. Let me lead the way, come I will give you a key to open the source of sweetness that is Provence. Opening hideaway places, and visiting private homes and artist's studios. Discovering the history behind antiques, culture and the Provencal lifestyle. With time to wander in places worthy to paint and write poetry about. Sip Champagne in the middle of the afternoon while the cicadas sing you to dance. Impromptu picnics, and moments to just be in the moment. To go to as many brocantes as you would want, without worry about how to take your purchases home. Meals with my friends, meals at restaurants and at my home, provided with as a feast of friendship. throughout every moment to be surrounded by happy places. To allow you to feel home in a foreign land. History connecting you to a never-ending story. Under a tiled roof, comfy cozy wonder goodness. Transportation provided, I wish it were this, with a linen canopy and fluffy chunky floral pillows to soften the bumps. Transportation so you can enjoy the scenery without reading a map, nor missing a turn. The weekends for the brocantes. June 25th to July 2nd, 2019, Two places remain. Possible October (let me know my friend Francoise can take you on a private outing, for as many or as few days as you want. except for airfare, insurance, and personal purchases. And if you are in Provence just come by and say hi! The history of my family started back before any of us were born, back before history was recorded, before ink and pen, somewhere amongst a woman's arms and a man's kiss, somewhere in the middle of a heart and soul. My father's and my mother's parents came from the Azores, the islands off of Portugal. The history of my family took place sailing across the ocean, traveling and working across the fields, buying farmland, and prayer. I never thought about it before, but the long row of fences that surround the fields remind me of rosaries dangled between my grandparents and parents hands. Pray they did. A photo of my grandparent's barn framed from wood from their barn. Farm animals in a row. Details of the entrance to my childhood home. Names use to tell us where we were from. Patti is not a Portuguese name. Chelsea is not a French name. Alfonso was the first name in the large book containing our family history dating back to the 1500s. Had I known that would I have named our son Sacha Alfonso? I do not think Martin nor Chelsea will either. Fifteen years ago we went to the Azorian island that my family was from. The above photo of Sacha standing in front of the massive stone wall/fences that surrounded the fields. My grandparents walked along those walls. They did not know that their great-grandson would one day lean upon them as their grand-daughter took his photo. Uncle Phil (My Father's sister's husband) and his daughter my cousin Julie (Sacha's Godmother who read at Chelsea's wedding) and Aunt Ann (my dad's youngest sister) and her oldest daughter my cousin Judy. Some of my nieces and nephew Gina, Patti, Kate, Marie, Molly, Maci and blessed is he among women: George. My brother's Mat wife Shelley and their daughter Marie. Three of my four brothers. My mother (the little blonde girl in the white dress) and her brothers, sisters, and her mother shucking corn. My father, brothers, and my oldest niece and nephews (Chelsea and Sacha are part of this group). Father McGoldrick, my cousins-godparents, Craig and Mary, and my father standing on his tiptoes to catch the moment. My mother took the photo. Family, you are where I am. Our lives and it will continue. "If you put a French person and an American person in the middle of a dense jungle and asked them to find their way out, the French person would bend down grab some soil look at it for clues, look up to see which way the wind blew the trees and which way the sun was moving across the sky... in other words the French person would study the situation right then and there before making a move. On the other hand, the American would climb up the nearest tree, look around and holler, "HEY! Anyone out there?" In general, because thankfully we cannot put a label on a whole country let alone a single person, the French are more methodical in their approach, trusting that they can find their way by themselves, whereas the Americans look at teamwork, and will go out on a limb to find a new way. If you ask three hundred thousand French people, "Did you have fun in (as in did you like, enjoy, consider school some of the best years ever...) school?" Two hundred and ninety-eight of them would answer solemnly, "No." Then they would look at you oddly, and ask, "Why?" French students go to school to learn how to study. Fun is rarely in the equation. The first day of school they are taught to come into the classroom, sit at their desk quietly. They are not allowed to talk unless they are asked a question. If the teacher asks the students for a response, or "Who knows the answer?" The French child is supposed to raise their hand no higher than their shoulder, with their pointer finger in the air. Unlike an American student they cannot wave their arm frantically, and with excitement saying, "I know, I know, ask me!!!!" The French are taught from a very early age to sit still, listen, obey, and if in doubt re-think, and if you don't know the answer listen, and if you think you are right you probably are wrong. Therefore when they do know the answer they know they are right. Their opinion is well thought out, they can back it up with an army of examples. They will listen to your arguments, your ideas, but in the end, they believe they are never wrong. An American student is taught they are the master of their universe, that they can accomplish whatever they want to do, as long as they believe it, work hard towards it and/ or have the money to get it. The American and the French come from a very different upbringing, a different approach to education and a way to be. In France, you rarely hear: "If there is a will there is a way!" Watching my children go through the French schools, and my listening to many of them talk about schools I have come to believe that I would have suffered greatly in their mold. Simply because I was raised to climb a tree, and believe in myself even if I didn't have a single example to back it up. This is not to say that one approach is better or worse than the other. Both have advantages, both are worthy, and both ways of educating can shape a different way of thinking. In the end, the American who climbed the tree, and the French person who studies the surroundings find their way... and both ways bring for an interesting conversation at the end of the day. Sacha wrote me the other day asking, "Mom do you remember the last time you held my hand when I was a child?" As we lived in an old house in the country not so far away from the village, close to a river and a forest behind us, we often walked to and fro the village and went wandering by the river that looked more like a stream. Up the hill from our house Annie lived, and in the surrounding fields wild tulips, asparagus, and rows of grape vines grew. Sacha's childhood friend Fabrice lived down the road. We held hands whenever we went, Chelsea on one side and Sacha on the other. Sacha wrote, that he remembers my hands were soft and warm. I probably stopped holding their hands when they were in the fifth grade. When I was in Seattle, Sacha held my hand, strong and giving, pure gift. Sacha's asking me about the last time I held his hand reminded me of other little memories that have slipped away from my day to day life. Sweet memories seem to pour in as I recalled his and Chelsea's childhood. Such as the time Sacha lost his first tooth I remember the morning when I went to his bedroom to wake him up for school but instead found him sitting on the edge of his bed holding his tooth, "Mommy, this morning, when it was still dark outside the church bells started to ring: DONG 1, DONG 2, DONG 3 and DING my tooth fell out at the fourth ring of the church bell!" In all seriousness that only a child can muster, he added, "I wonder who is going to leave me money under my pillow, the American tooth-fairy or the *French little mouse?" Customs in France are not always the same as in the USA. Stories collected, memories gathered thoughts that keep me going on dark days. The patterns in the sky, the unfolding of hearts, life in the monastery and how I learned to pray while cooking. Stories of finding and keeping and losing and weeping, the struggle of having lived when death thought to call. Moments of living the words of a dream: Life continues to continue even when unseen. Memories of childhood and Portuguese donuts and saying the rosary with my cousins. Running in dry rice fields, cracking walnuts, riding motorcycles and walking down the lane. Marty, Mathew, Mark and Zane. The best deal I ever found in the shadiest puce was the rarest gem. What words tumble from your heart and soul? What words tell your story? What book would you write? Writing a blog starts with a theme, and usually, that theme has to do with a person's interest or passion, such as food, family, crafts, politics, social awareness, style, or a knowledge regarding a certain area of expertise. Blogging is vast and takes on many subjects, some bloggers blog with a goal in mind whether for their business, pleasure or a way to keep in touch with family and friends. Blogging is journalling, it can be personal, it can be deep, lighthearted, carefree, connected, challenging... blogging is usually one person's voice as she or he feels comfortable in sharing online. When I started a blog over thirteen years ago it was to share about my life in France with my French Husband, and two children, about brocanting, spiritual reflections, recipes, photography... a hodgepodge of whatever was on my mind. As the years went on I just kept doing more or less the same thing without focusing on a goal other than to be myself. Blogging opened up a world of friendships that I hold dear, plus I created an antique business, started freelancing for magazines, and ventured into sharing Provence with small groups... Blogging has given me many avenues to express myself and I am grateful every day for it. Lately, I have received emails regarding questions about politics, and as much as I like talking about politics in person, I do not feel comfortable doing so on my blog. Occasionally, I have hinted about politics about where I stand, but it is not a direction that I want to familiarize my blog with. If I start putting politics into my blog it might not end, it might change the feeling of my blog and readers, it might open Pandora's Box and lead in a direction that I am not willing to go with this blog as it is. With that said, I would encourage anyone who is curious about what is going on in the world to read a variety of news reports, to listen and share with others who want to do so online or in person. I am open to ideas, your thoughts and feedback, blogging is not a one-way street. Why do you read my blog? Is there something you would like me to dive into deeper or talk less about? Though if it is to talk about politics I honestly do not want to share about that here. Thank you for being part of my world, and with your comments and emails thank you for letting me into your world. French la Vie Guided journeys in Provence, and Bretagne. French la Vie will lead you to discover France through different lenses sharing the heart and soul of Provence and/or Brittany. The French la Vie Journeys are handcrafted to each group that comes. If you like antiques we will visit markets and have personal entrance to little shops in private homes. If you want to find places to soak in daily life for inspiration we will wander through villages, peeking around corners and discovering history by seeing. If you want to visit artisans studios: painters, potters, cooks, winemakers, the cornucopia of food, and or simply learn about the French lifestyle by being immersed into the beauty of France, then this is for you. Sharing stories, gathering memories, planting dreams. Ever grateful for the path that my family, community, faith have created, fortunate for the gift freely given, and that I hold with all that I am. We had a short visit a few days with my family in Willows and a few days with our son Sacha in Seattle. It is always too fast. It ends so quickly and I leave hoping it will be there when I return. And this trip was infused with Paradise, reminding me that nothing is forever except what we hold within. Paradise reminds me to keep what is important in front: to learn to grow in love. To put love in front and keep it as my focus. Not to get weighed down by anything that comes to distract me from loving. That is the goal one that I need to work out to achieve. That field, that sky, that land I call home. My inner child runs to meet the child that was happy go lucky playing in the fields behind my home. Where is your golden field? What do you cultivate from it? I want to plant seeds of thanksgiving. Thankful for the road ahead, for the road behind and most of all for the road where I am right now, rolling between both. 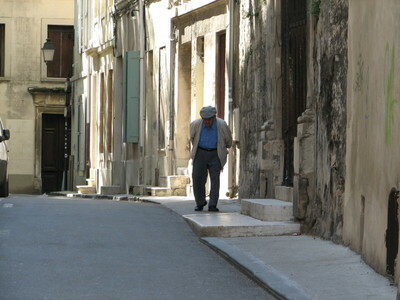 Then please come to visit and let me show you the Provence I love. or by staying in our House Next Door. Where Do Our Words Leads Us? Last night I watched a video (linked below) called: The Birth of a Word. I was amazed and moved. Amazed that someone could imagine how to capture the birth of a word, and amazed at that implication of what that means. Imagine capturing the birth of a word?! While watching the video I realized in a profound way the gift, or trouble our words can have on one another. That what we say does matter. That our prayers are heard, that our life song can lead others to move. Our words have, whether we believe it or not, whether spoken out loud or in our hearts, an energy, a vibration, a rich source that can be given to one another as a healing balm and or as a tool to move forward... Depending on how we use our words of course. If we see our words as tools then what we think and say should not be taken lightly. If we add our words to actions, then we can be encouraging vessels of love, goodness, and hope. The power of words spoken out loud, and in one's heart... it is a gift I want to embrace. In the video "The Birth of a Word" I was struck by the graphics Deb Roy created to explain his point. While listening to Mr. Roy sharing how he collected information regarding television programming, then matched those words to a massive collection of words being said at the same time regarding the televised program they were watching. I was awestruck by the avenues that Mr. Roy's thoughts lead me. One of the avenues my thoughts went to was about prayer: How words spoken in prayers do resound, move through space and time such as Mr. Roy's graphics showed, creating a mass, one voice. It made me believe even more in the power of prayer. I thought of those in California, the fires and how hundreds, thousands of people have "prayed" "talked" gathered to help process the tragedy, understand and seek refugee, to share the long journey of healing in prayers a unison voice of love. Another thing Mr. Roy made me think about was how he was able to collect/record the words said over five years in his home, then trace them (by video) to where in his home they were said, and then showed, for example that the word "water" was said more often in the kitchen or in the bathroom. Not that I expected the word water, being said by his child, would take place anymore in any other place. But the thought that stirred strongly in me was, "What word circles around me? What word or words, represents me? If the word "water" in Mr. Roy's description was heard, spoken and helped learned by being in the kitchen and or bathroom, then what word is thought of when it comes to me, or any of us as individuals? What do we offer others by our being who we are? If words are learned by being around you or me then what would they be? I better stop swearing today. Words, prayer, good intentions may ours be ones that lead to all that is good and worthy, and less towards distraction and false avenues. Staring at the French menu, French Husband translated it for me but not word for word. He read, "Chicken no. Lamb no. Bunny certainly not. The liver of a duck...Oh, I use to love the liver of the duck... mais no." We were vegetarians in a world of meat eaters. Slim pickings' with a whole lot of desserts. The waiter came to our table, pencil in hand, not a smile upon his face dressed in his black coat and long white apron. Food is a serious business in France. I felt like a small potato on a kitchen counter looking at the pot of boiling water. Pretending I knew how to speak French I said, that we did not eat meat, and could he suggest something for us? Beaming with pride that my broken, heavily accented French had caused the waiter's left side of his mouth to turn up, I thought he smiled and waited for his response. Instead, he simply clicked his heels and said, "Alors? (Well then?)" French Husband leaned across the table, grabbed my hand as if the moment were intimate, romantic, I felt a rush inside but my bubble burst when he said, "Corey, you just told the waiter, that we do not eat food." My red face did not match my lipstick. I looked up at the waiter with an awkward smile. You see the word "Beef" which is pronounced: "Boeuf," and the word "Eat" in slang is: "Bouffe." Looking at these two words you can see the difference is not extraordinary. I learned how to say vegetarian right then and there. This is our grand niece Tatianna she is fifteen years old. The mothers gathered at the school gate wore their coats unbuttoned. I took off my scarf and stuffed it in my pocket. The Autumn day felt more like late summer than mid-November. The two little ones (my French niece and nephew) I waited for were no different than the others. I too made them put on their coats simply because I could imagine them tripping over them as we walked home. As we headed home the two of them talked to their little friends. One of the little boys stared at me while I told my nephew, "You do not need to button your jacket, it is too hot." My niece leaned over whispering to the other little boy, "That is my Aunt, she is an American she doesn't speak French." Like a tattle tailer I chimed in, "Hey, I speak French!" "My Aunt speaks a little," she corrected then added, "but she doesn't understand French." "Wait a minute! I do to speak French and I understand exactly what you are saying." I said like a school girl defending her turf. "She doesn't, honestly she doesn't," my niece said as if I wasn't there. Stopping in the middle of the sidewalk I said to the little boy, "I do too speak French and I understand what is being said." I guess you could say I needed his approval. "I do too speak French," I whined. "I understand your Aunt, she is speaking French." He smiled as he ran towards his mother. My niece looked at me like I was in big trouble, as if I had spoiled her fun. At that moment it became clear to me, I was her novelty. I was the cool American Aunt. I was her "Show and Tell" item in her bag of tricks. Because of my bruised tender ego, I ruined her fun. "Dommage!" I did not understand French after all. Today while hanging out with Tatianna and her mother Juliette, we spoke English, I was amazed by her progress. A little girl who had short red curly hair, bobbed up and down the aisle while her Mother looked at undergarments. I was amused by her non-stop chatter and her Mother's forthright replies. When the little girl wandered-off, the Mother would question, "Where is my shadow?" The little girl would quickly return assuring her, "Here I am!" I was captivated by their relationship. "Look Mommy SHE' S really, really big!" Her mother paused... then gathered the little girl in her arms, "Yes she is big and you are small. The woman is just right the way she is. I am just right the way I am, and you are just right the way you are. We are perfect however we are made, big or small." The Mother put her daughter down, and the little girl started twirling, her red hair danced on her forehead. Isn't it good to know we are "just right" the way we are? Hearing that message (which certainly was meant for me,) made me think how satisfying it would be to never criticize or think about how I looked ever again. To simply get up get dress and not waste another nanosecond on trying to look one way or another. To accept with gratitude that I am just right the way I am and not be bothered dying my hair, wearing makeup, those extra pounds, this double chin, this nose and instead see the naked me in wonder and awe. A homeless man rummaged through the garbage at the train station, he found a coffee cup that someone had thrown away he opened it to find it empty. He gently put it back in the garbage then turned around not looking at anyone he was smiling. He stood and watched the crowd seemingly entertained I assumed he was mentally challenged by his movements and actions I wondered what his life must have been to be rummaging through the garbage and not asking for money. I approached him, tapped him on his shoulder and asked him if he would like a coffee, he shook his head yes. I gave him some Euros and he walked over to the coffee machine dispenser. His sincerity struck me: the man was hungry, not begging, admiring people, smiling even though he had little- holey shoes, worn coat, unshaven- he was in need and nobody noticed him despite the fact that his soft-spoken eyes took in everyone. I felt spoiled and fortunate. Grateful and sad. Conversations rattled with questions, proclamations, at the speed of light through my mind and heart: What is life all about? Why him and not me? Why am I so lucky to be born by loving parents, brought up in a safe environment, and not him? What is this all about? And God, or and this Energetic Force of incredible life and love that I believe in what is the point of this? Food wasted, lives wasted, richness, division, reality stupid TV, barriers, a man digging through the garbage at a train station with at least several hundred people who have full bellies, warm clothes, do not stink of urine, have beds to sleep in without a threat of bombs or fear standby. I turned around and went back to talk to the man, but he did not have words, just a smile. I asked, "Are you hungry?" He shook his head yes. I asked him to follow me to a cafe counter which had food ready-made, "Please pick something to eat and I will pay for it." Slowly, he studied each plate of food. Hesitated with uncertainty was it over preference? I could hear the expression, "Beggars cannot be choosers." How sad. I said to him if you want more than one plate that is fine with me. He chose pasta with chicken. I pointed to the desserts, "Would you like a dessert?" He shook his head and selected yogurt with fruit. We walked together to the checkout counter and I handed him money that was enough to buy what he had in hand plus dinner and breakfast the next day if he wanted. He was surprised. I said, "Bon Appetit," and walked away. Am I a good person simply because I extended myself to someone in need? Maybe, but not a Superhero or worthy of a Nobel prize for generosity, it was a small gesture that took a few minutes of my time, and gave a hint of a respite for him. Nothing more than doing the right thing because I could. A few moments of my hours of good fortune and comfort and only a full belly for him for a few hours. Life is unfair. And more so when the players think it is fair that their God might be handing blessings to some and not others. Or some sort of karma thing, "what goes around comes around." I have always had a problem with that. To me, that seems like a calculated love, a childish reasoning, "If I am good I will get a candy blessing and if I am bad I will not have one." If that is how it works it isn't challenging to love deeper, but to aim for a reward. That isn't love to me, that is only selfishness disguising as love. The man who was digging was searching for his meal, how many times have I walked on by not extending myself to the person in need. How many times have I justified my actions with judgemental words that seem to make my not doing something acceptable? His gentle smile spoke of his acceptance or ignorance... either way it is a life so very different from the comfortable one I have. It woke me up to his need. "I see the world being slowly transformed into a wilderness; I hear the approaching thunder that, one day, will destroy us too. I feel the suffering of millions. And yet, when I look up at the sky, I somehow feel that everything will change for the better, that this cruelty too shall end, that peace and tranquility will return once more." A step in a good direction, his direction was needed. Even if it was one step. It was at least a step forward. Mother Therese was feeding a starving dying baby in India while reporters pestered her with comments such as: "You cannot save the dying, you are only one person, look at you only caring for one baby in the sea of many dying people. What is that you are doing..." and as they threw their frustrating demanding, insulting doubts towards her, Mother Therese focused on the baby in her arms, "Look how he takes the bottle, look how he looks in my eyes, look how he is eating..."
Love is taking what we have and doing something to help someone. A small stone cast caused ripples. Those ripples went forth regardless on where they would run. Casting our stone is a daily choice. "Whatsoever you do to the least of my brothers/sisters so you do unto me..."
And who is me? Who is God? You. Him. Her. The man digging through the garbage for something to eat, the immigrant, the refugee, the person of a different race, color, faith, the air we breathe, the link that connects us all, the source of love, the thread that holds us because we are one. We are God and God is us. Today I shared with God and he gave me his hand to hold and I felt strengthened by his smile.